Towards the very end of 2014, I took a trip. A long trip. Toronto, Canada to Dhaka, Bangladesh. Door to door the journey took over 24 hours. Now flying across the world does have its perks, I was able to watch A LOT of In-Flight Entertainment – some good (I watched Mission Impossible: Ghost Protocol no less than 3 times), some not so good (like the miserable “rom-com” where the female protagonist ends up in an abusive marriage, while the male protagonist becomes an utterly depressed alcoholic… yeah, “rom-com”.). Flying across the world also has its cons, jet lag being one of them. There’s a 10-hour time difference between Toronto and Dhaka; that’s literally night and day. But I didn’t feel jet lagged. In fact, I felt great. So great that I decided to go to the hotel gym my first day there. I had a fantastic workout. I was incredible. People would even stop to watch me, no doubt in awe of my magnificence. But it was only towards the very end of my monumental workout did I notice that a pretty female gym instructor would circle around me, and every so often allow her gaze to linger. I wasn’t sure what to think of it at first. Is she attracted to me? Maybe she’s impressed by my awesome workout? Wait…no, did I forget to wear my shorts or something?! She smiled and walked towards me. “Hi!” she said. “Hi. How are you?” I replied, still a little confused. “Did you know this is the Ladies’-only Gym?” And there it was. Jet lag – the ultimate prankster. Somehow, despite feeling great, I had managed to walk into the Women’s Only section at the gym. Thankfully, there weren’t any women working out at the time – would’ve hated to make anyone uncomfortable! Everyday following, for the rest of my trip, I started my day with an Orange-Blueberry Smoothie from Room Service, it was the perfect burst of energy and nutrition to start off my very busy days. I’ve fiddled with several versions of the smoothie since then, and today I’m presenting my favourite version. Hope you enjoy it! Combine first 5 ingredients in blender. Puree until thick and smooth. Pour into glasses. Garnish with blueberries, and a thinly sliced orange peel. One of my favourite aspects to having a morning smoothie is the lack of fuss. 10 minutes (at the most!) to get it ready, and then 5 minutes to wash up. Brilliant. Do you have a favourite smoothie? Any particular smoothie recipe you’re curious to try? Have you tried mine? Comment below and let me know what you think! 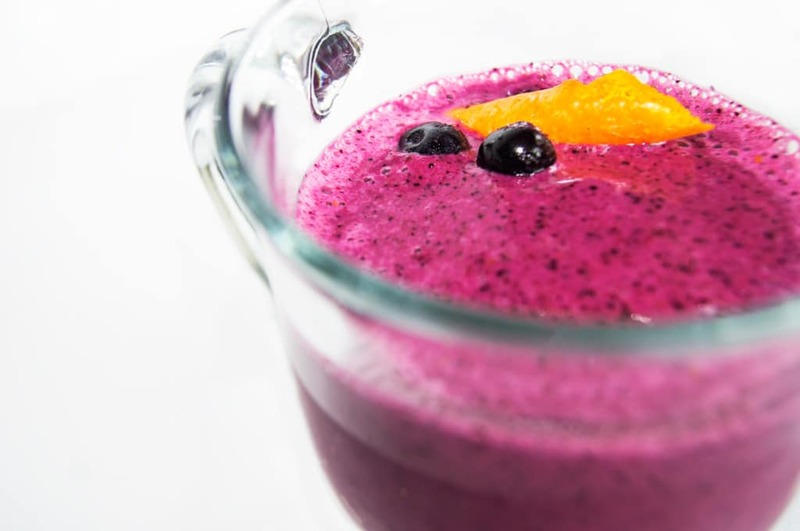 This Orange-Blueberry Smoothie is a perfect breakfast option. It takes less than 10 minutes to prepare, and it’s not even 200 calories. Combine first 5 ingredients in blender. Puree until thick and smooth. Pour smoothie into glasses. 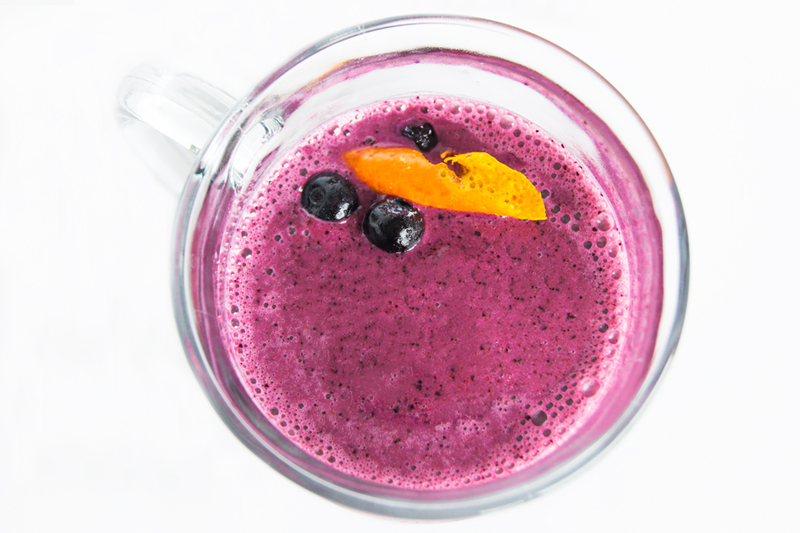 Garnish with blueberries and thinly sliced orange peel. Wow! That color! Yum…can’t wait to try! Hope you like it Amy! 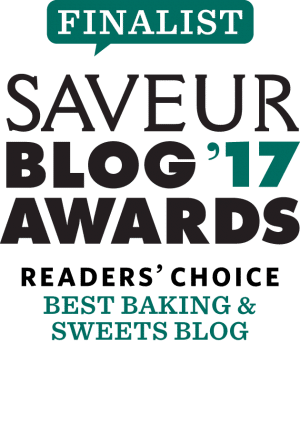 Just drooled a little while looking at your Ice Box Cake recipe! This looks great! 🙂 I love blueberry smoothies! Thanks! Any berry smoothie generally is a win for me! Looks absolutely yummy and refreshing. 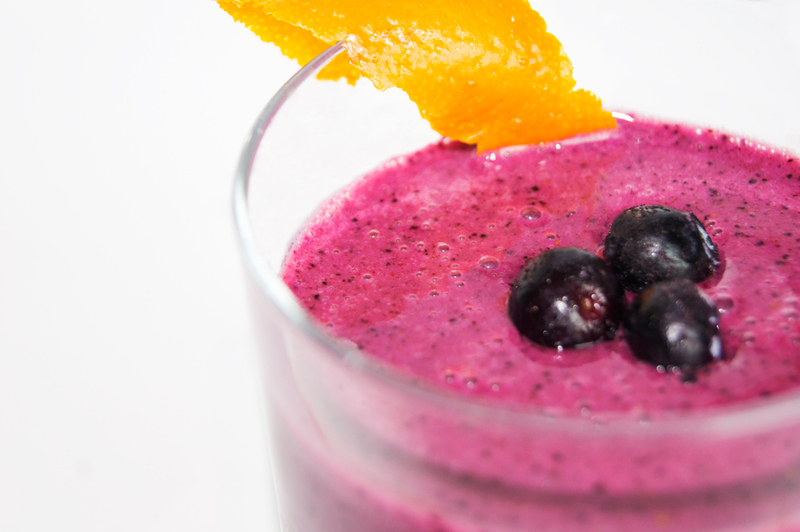 Love the combo of blueberries and oranges for a smoothie. Hahaha, can’t stop giggling over your gym exploits. An easy mistake to make. Your smoothie looks so vibrant, I’m rather regretful I didn’t have one for breakfast now. I’ve been mostly having green smoothies recently, but I feel I fruity one is on the cards soon. Hehehe, thanks! I do love the colour of this smoothie! Love that story! haha! Just heading out to the store, so am making sure I have all I need to antioxidize myself. Thanks for the Friday laugh and a good eating reminder. Hope you’re having a good weekend Diane! Oh my gosh! That color though. I love smoothies and this one definitely sounds like a great pick-me-up in the morning! Thank you! I love the colour of this smoothie too, it’s almost like you can see how full of antioxidants it is! Your smoothie looks yummy and the pictures look awesome! 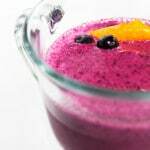 The orange peel against the vibrant blueberry colour makes the smoothie look so enticing – great food styling! Best of all is your story linked to this smoothie which is so captivating and hilarious that I would remember your smoothie forever. Haha ha!! Thanks very much! I’ll definitely never forget the story behind this recipe either! haha! Loved your story, Riz. I can relate to the jet-lag. It is a killer for a day or two or three. That lovely beverage would make everything right with the world though. Thanks for sharing. Thanks Denise! Jet lag is a silent killer! Hi Rojens, that’s awesome! I hope you enjoyed it!